The effects of the floods in the city centre were barely visible other than on the river banks, where lots of debris and tree branches could be seen. 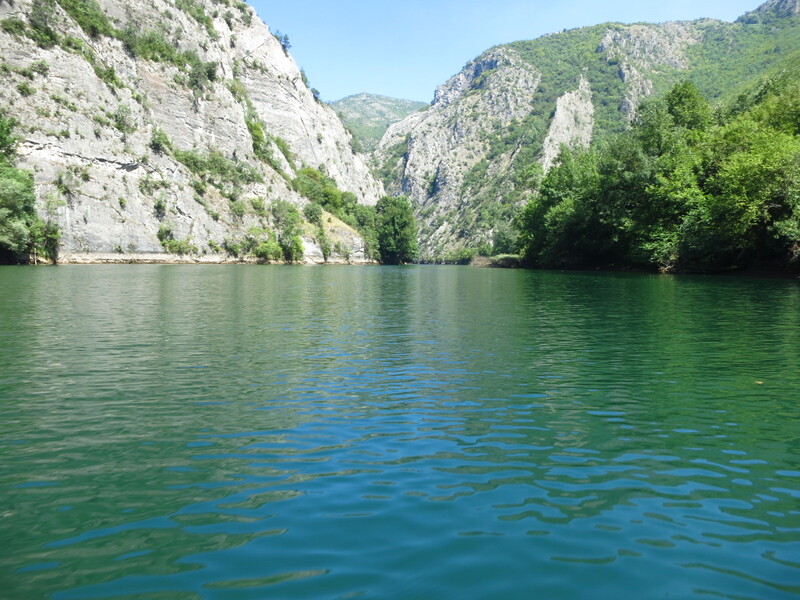 Aside from visiting the city, the other thing that had brought us to Skopje was Matka canyon, which we wanted to explore by kayak. 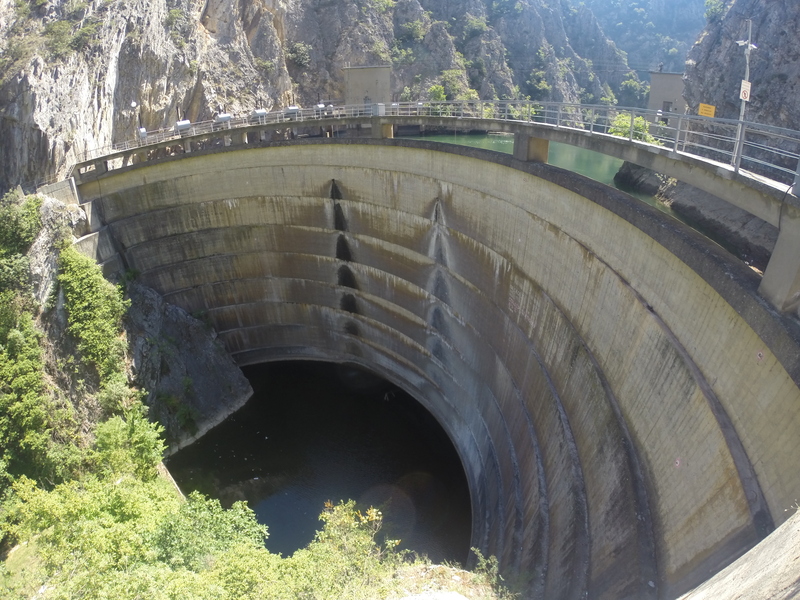 I was afraid that it might be dangerous due to the floods, but it turned out that there is a dam which forms Matka lake and regulates water flow, together with the fact that the floods had affected the north part of the city and the canyon was to the southwest, so Goran assured us that there was no problem. 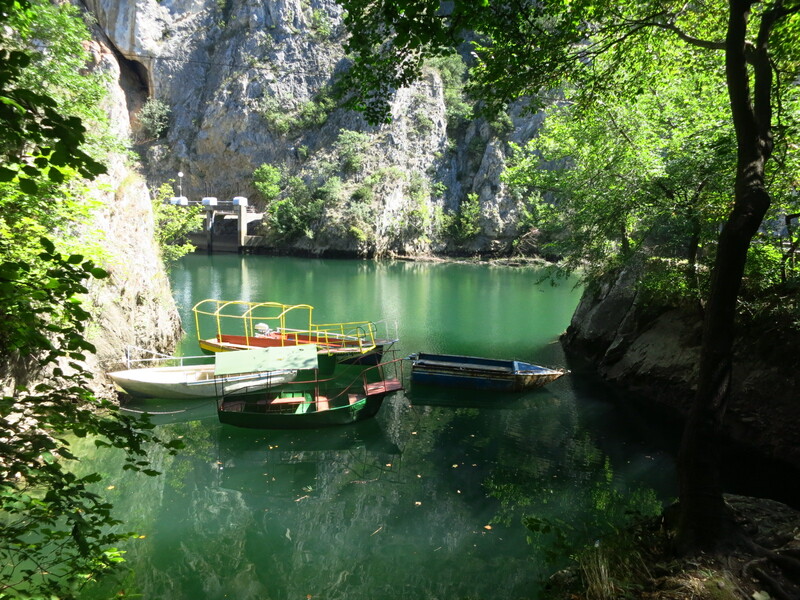 He also told us something we did not know – the lake is home to Vrelo cave, a big cave with very interesting stalactite formations and two lakes inside. He also gave us directions to the entrance of the canyon, which was only 18km from the city. 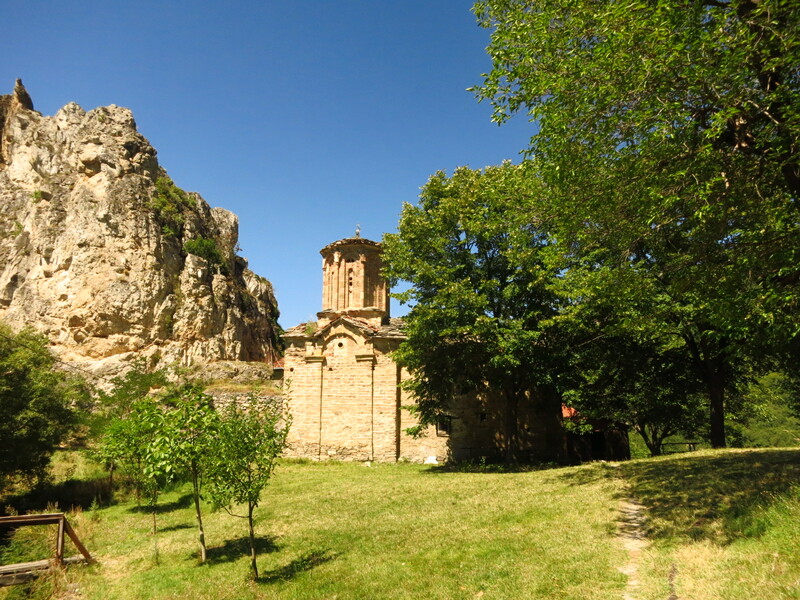 A short while after leaving the hostel I remembered Goran’s directions – ‘straight ahead, you can’t miss it, you can’t miss it’ – while the GPS took us through a narrow road that crossed a neighbourhood on the outskirts of Skopje where we saw exactly zero signs pointing to the canyon. The only sign I saw was when we were already there, so once again I was very glad to have the GPS. The road ended in a small car park where we saw no signs of a place that rented kayaks (or the lake), but there seemed to be a narrower road going on from the further left corner of it, so up we went on the bike. It became a lot narrower a few meters down, and we realised it was a pedestrian path, so I parked the motorbike on a space by the path and Nat went ahead to ask about the lake and the kayaks. It turned out that the dam was right round the next corner, and the kayak place five minutes further up. As we were changing out of the motorbike clothes, a security guard, presumably from the dam, walked past, and I asked him whether it was OK to park the bike there. He gave me a thumbs up and pointed to a security camera I had not seen. 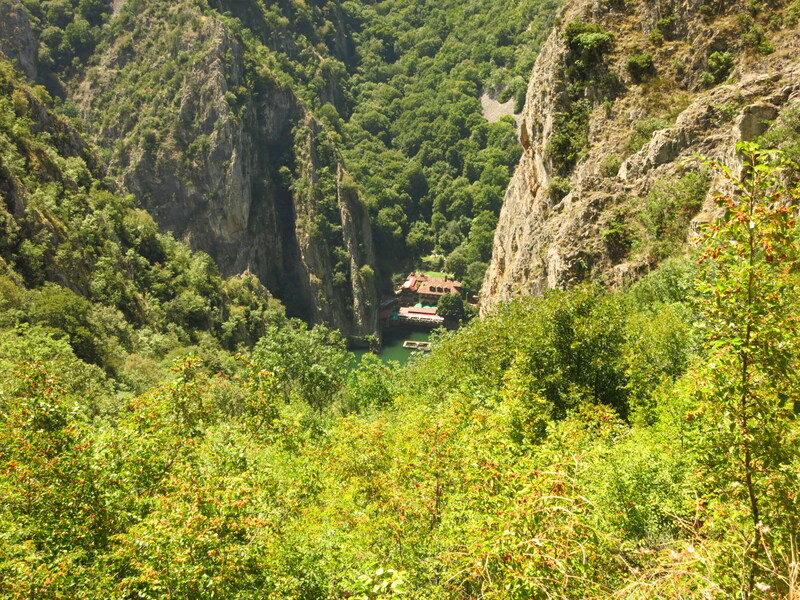 After a short walk we reached a place where the walls of the canyon opened a bit wider and found a restaurant and a small wooden hut with a flight of wooden stairs leading down to a jetty where three boats and several plastic kayaks were moored. They told us that two hours were enough to reach the caves, visit them and come back by kayak, and that they also offered tours by boat. Seeing that the kayak was only marginally more expensive and would not only last longer, but give us more freedom, we rented one. This was the third time that Nat and I used a kayak, and I am happy to say that after being able to go on shopping trips to IKEA without getting into an argument, managing to row a kayak in a straight line without shouting insults at each other is a clear sign that our relationship is solid. The journey through the canyon to the cave provided great sights, and we reached our destination faster than we were expecting. 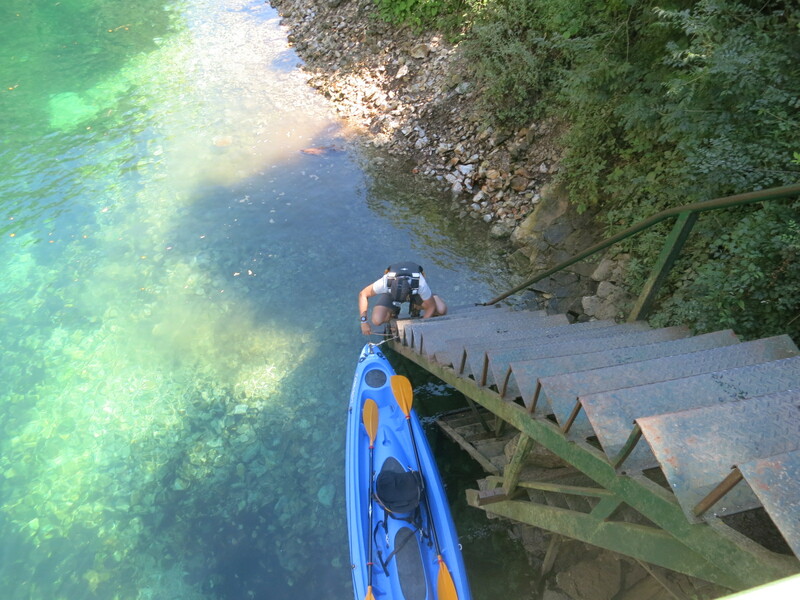 After some amateurish manoeuvring, I tied the kayak to the stairs that led to the cave and we got off just as a boat with a small group was also arriving. 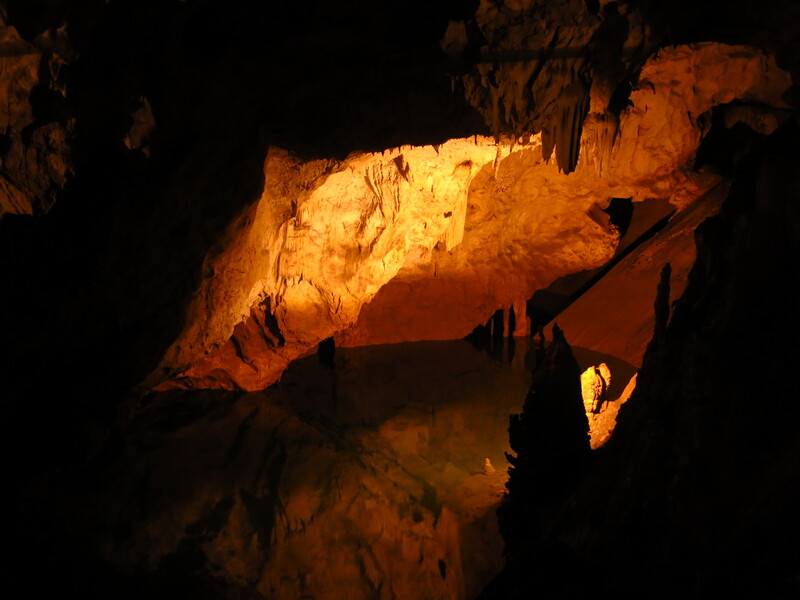 That was quite good timing, as we had no flashlights and the guy in the kayak hut had told us that the caves were illuminated but the generator was only turned on by the guides on the boats. We joined the group and profited from light and a short explanation. The caves were amazing, and it seems that there is a lot more underwater, at least three other caves from what we were told. Not everything has been explored, and they said that it might be the deepest underwater cave in the world. I can only imagine how claustrophobic it might be to dive in those conditions, swimming forward into the unknown through narrow gaps knowing that there is no air to float up to if something goes wrong. We took the way back a lot easier, knowing that we had time to spare, and when we reached the hut they told us that the short journey across the canyon to the other shore, from which a path went up the mountain and to a church, was free for customers who had rented a kayak, so we took the chance to go visit the church. When we got off the boat after the short crossing, the guy warned us about the steep walk in the midday heat and pointed at a metal plate and a hammer hanging from a tree and told us to bang on it to call for the boat back. I am a keen hiker, but I almost had a heart attack on the walk up to the church on that heat… at least the visit was worth it, the church was on a small col where there was also a fountain and what seemed to be some picnic and camping facilities for the people who were hiking the trail that reached the canyon from Skopje, about 16km across the mountain. We made our way back down, I stopped to collect my underpants, which had got wet in the kayak and I had left drying in the sun on the way up, and when we reached the shore I used the high tech intercom to call the boat. The GPS took us on a much more direct route back to the city in the afternoon, which I imagine was the one Goran was telling me about the day before, and we went back to the same restaurant for a very late lunch, since the service and the food had been excellent the previous day. There we had a long chat with Ace, our waiter, who told us he was volunteering to help the flood victims, and complained that aid was being distributed unequally depending on the political party the victims were members of. If you are in Skopje, do not miss this restaurant – Etno Bar Grill, by the river in the centre. 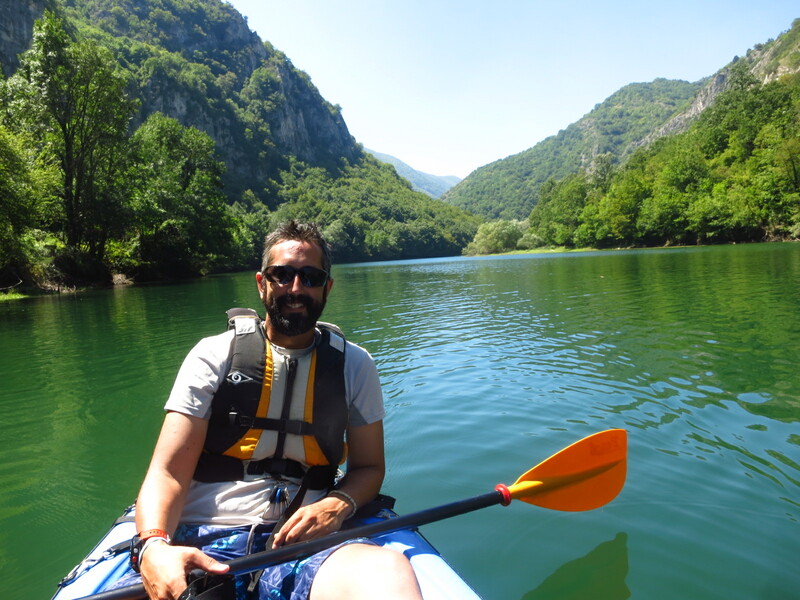 This entry was posted in Balkan Adventure 2016, Travel and tagged Etno Bar Grill, Honda CRF 1000L, kayak, Macedonia, Matka Canyon, Matka lake, Skopje by Kilian. Bookmark the permalink.